ChiIL Out with ChiIL Mama and enjoy a fun family event happening in Woodstock, IL on Sunday, October 27th in celebration of the upcoming release of FREE BIRDS. The Woodstock Community School District 200 is hosting an afternoon of fun family events October 27th from 12pm-2pm in the Woodstock Square. All proceeds from this event will help support District 200 technology initiatives. 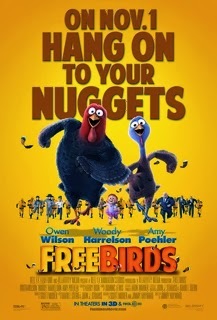 FREE BIRDS will be released in theaters on November 1, 2013.